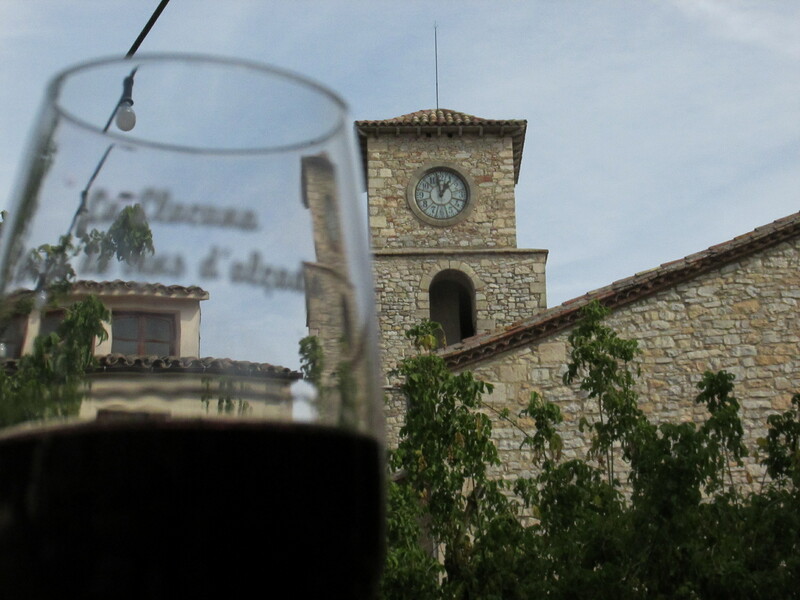 The annual wine festival La Llacuna Terra de Vins d’Alcada took place in October 2013. The celebration of the plump jewels took place in the middle of the hilly wine country of La Llacuna (Penedes), a town with 900 smiles…and 1800 feet that have the scent of grapes ingrained in them. As more and more people were beginning to pour into the village square, the smell of wine, cheese, and cured meats were playing the Spanish orchestra of growling stomachs. The vines from the recently finished harvest were being burned in a pit for a barbecue in a corner of the square, sending a smokey bouquet through the air which foretold of an epic meal. Cutting through the orgasmic overload of olfactory stimulations was the sound of the Shawm, a traditional double-reeded Catalan instrument which sound resembles the sharpness of a bagpipe. Along with the Shawm band came 2 Catalan Giants which stood tall into the dry blue sky, marking the beginning of the festival. The 7 spanish couple made of wood and paper-mache jumped,swayed, and spun the traditional Catalan circle dance, the Sardana, as children watched with their mouths open in awe. As soon as the skirts that were mid-air from the final Sardana spin floated back down to the archaic stone floor of the square, the sound of popping Cava bottles marked the beginning of the festival. The festival booths were mainly of wineries, majorities of which were presenting their Cavas. Each glass of Cava varied dramatically in bouquet, aroma, taste, and mouth feel but one thing was true of all of the cavas; it replenished the thirsty throat from the dry spanish air as warm butter smoothed out the harshness of fresh bread. The wide array of sausages and patés were full of diversity which allowed for many different pairings. The locals had to stay attentive towards their nibbling on the cured meats to make sure that the appetizer did not eventually become the main dish. Another popular culinary piece was the local cheese which included cow, goat, and sheep cheese. Tasting the different cheeses at different stages of the aging process suggested that there really is a perfect cheese for every one. The same cheese can present such different colors simply by a few months difference in age. Another piece that was being presented at the festival was the local honey made in the factory just a few seconds walk from the town square. The string of gold sparkled in the mid day sun as it was being slowly laid onto the perfectly burnt piece of miniature toast. The taste, contrastingly to it’s appearance, was as fresh as a breeze in a field of flowers. It’s sharp sweetness, mild yet present acidity, and lemony bouquet was a perfect refreshment from the other heavier snacks of the festival. While the adults enjoyed a warm afternoon filled with local culinary delights, the children gathered around the donkeys and horses which gave children rides around the town. Their innocent giggles and wide open eyes added a youthful and relieving air to the crowd. And once that air loosened everybody up enough (with a little help from the alcohol), it was time for the annual grape stomping event! A huge crowd gathered around the three wine barrels that had been cut in half that was filled with freshly picked !!!!!!!!!!! grapes. Behind the barrels were the participants of the crushing who had their knees and elbows bent in anticipation of the MC’s cue to start the dance which would begin the transformation process which converts the jewels into a magical elixir. Once the sound of “!!!!!!! !” resonated amongst the rowdy crowd, the grape dancers jumped into the pile of grapes and started stomping as if there was no tomorrow. Grapes were flying everywhere, limbs were going all over the place, the faces of the stompers were full of life and energy, the air amongst the entire square was filled with intense jubilation and naivety. After a while of stomping (including one of the giants that decided to participate) , the MC signaled for the participants to leave the barrels. The little girl who attempted to get her final extra stomps in was shouted at by the MC as if she was his own son. The three buckets were lifted to determine which had the most grape juice in it; the crowd grew silent and a new tension was created amongst the audience. Once the winner was announced, hands flailed into the air and the entire town broke into cheers. The liveliness in the participants eyes remained even while washing off the stems, seeds, and grape skin from their glistening feet. As the grape stomping came to a slow end, the church clock facing the town square stroke two and let out a meditative vibration with its ancient bells which brought the lofty spirits of the festival back to earth. The festival was over, but the passion of wine and life remains in the air of Catalonia, as it has for centuries before.